Recent LTI Ph.D. grad Siddharth Gopal was awarded the 2014 School of Computer Science Dissertation Award and has been selected as one of two SCS nominees for the ACM Dissertation Award for his thesis, “Large-Scale Structured Learning." Each year, SCS presents its Dissertation Award to the most outstanding graduate of its school-wide doctoral programs. Each nominee was reviewed by three members of the award committee and ranked based on technical depth, writing quality, significance of the work, broad impact on SCS and the strength of their recommendations. 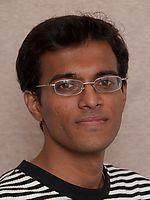 Gopal, who was advised by LTI Professor Yiming Yang, earned his Ph.D. this past summer. His thesis studied large-scale supervised, semi-supervised and unsupervised structured learning. Gopal will receive a cash prize as part of the award, and will give a distinguished lecture on campus. For more on Gopal’s work, visit his blog. As one of the school’s ACM Dissertation Award nominees, Gopal’s work will also be submitted to the ACM’s award committee. Winners will be announced this coming spring.